Helicopter transport is a common choice for shuttling offshore workers to and from oil rig worksites. Offshore platforms are not suitable for landing a small plane, and boat travel is much too slow. While helicopters offer the quickest method for moving maritime workers on and off of a vessel, they are also among the most dangerous choices for transportation. Unlike an airplane, the spinning props of a helicopter don’t glide. When the props stop spinning, a chopper crash is imminent. Richard J. Plezia & Associates has an experienced offshore helicopter accident lawyer team in Houston, Texas that will represent injured employees and families suffering the loss a loved one in a chopper crash. Our maritime lawyer team fights for just and timely financial payouts that offer real compensation for your loss. Weather. Poor flight or visibility conditions play a major role in most aviation accidents. Choosing to fly in poor weather may be considered negligent. Equipment Maintenance. Faulty or poorly maintained equipment can lead to catastrophic failure of the helicopter. Navigation Error. Even with the GPS equipment of today’s choppers, navigation error can lead to a crash. Pilot Error and Landing Mistakes. Landing on an offshore rig takes a skilled pilot with an appropriate amount of logged flight time. Injuries from a chopper crash can range in severity from broken bones to wrongful death. 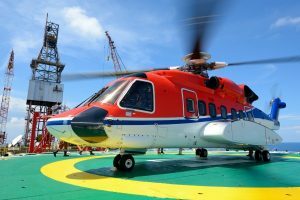 Offshore workers involved in a helicopter accident will often be unable to work during their recoveries. As maritime workers, you may qualify for Jones Act financial compensation in the aftermath of a chopper crash. If you have been injured in a chopper crash, contact the offshore accident lawyers at Richard J. Plezia & Associates for a free review of your case. Recovering damages for medical bills, lost wages, and mental anguish can all be part of your financial payout from a pilot and/or helicopter company that acted with negligence. Our attorney team represents injured maritime workers across the Houston area. Call us today and speak with our experienced offshore helicopter accident lawyer team.